Don't forget April 25 is the annual Cherry Blossom Walking Tour and Festival. 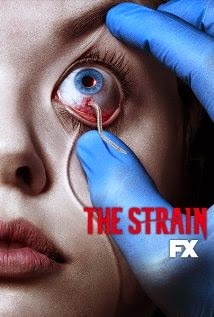 The FX TV series The Strain will be shooting scenes tomorrow near the Roosevelt Island Tram. Please be advised on Sunday, April, 19th, 2015, Tram Road has been permitted for a Film Shoot, which will involve the use of various prop weapons. Tram Road will be closed to vehicular traffic from 10 AM to 11 PM. All vehicular traffic will be directed to use the Transverse Road or Traffic Circle to travel North bound. The Red Bus will disembark South bound passengers at the Tram as normal, but will pick up North bound passengers at the Q102 bus stop on the West Roadway. 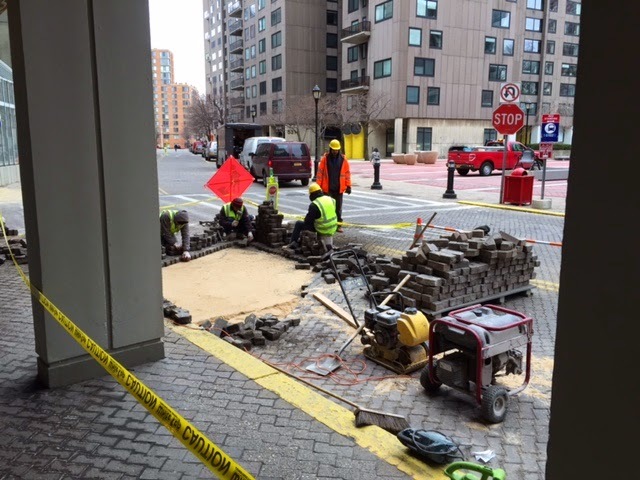 Expect intermittent traffic delays and increased pedestrian traffic in the area during this time. Here's the world of The Strain. RIOC permit fees for film shoots here. UPDATE 4/20 - Scenes from The Strain film shoot with actor Kevin Durand. That's 10 weekends in a row. The new Roosevelt Island normal? 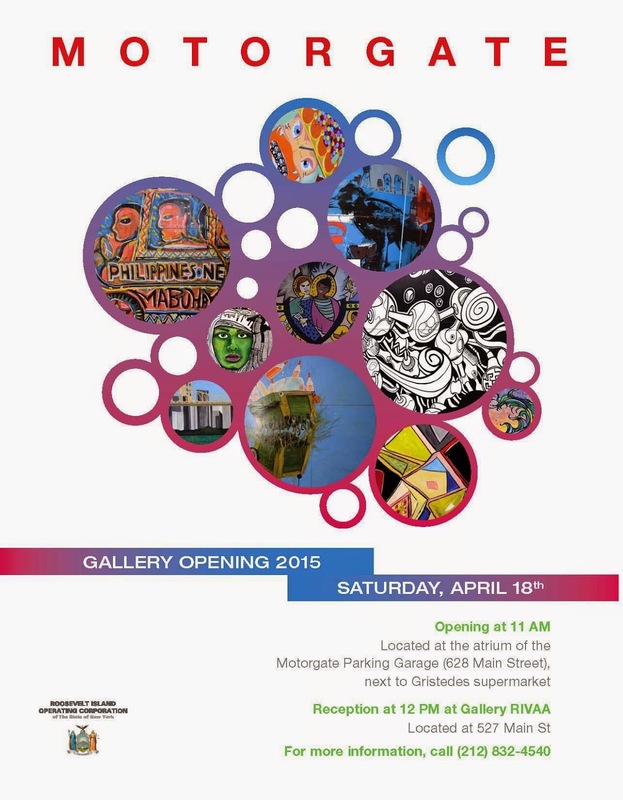 You are cordially invited to attend the 2015 Motorgate Gallery Opening. The event will take place at the Motorgate Garage Atrium (628 Main St.) this Saturday, April 18th, at 11 AM. Come and celebrate the addition of new murals painted at the 2014 Fall for Arts Festival to the Gallery's collection! The Gallery opening is sponsored by the Roosevelt Island Operating Corporation and curated by the Roosevelt Island Visual Art Association. Immediately following the opening, a reception will be held at Gallery RIVAA, located at 527 Main Street. Drinks and light refreshments will be served. 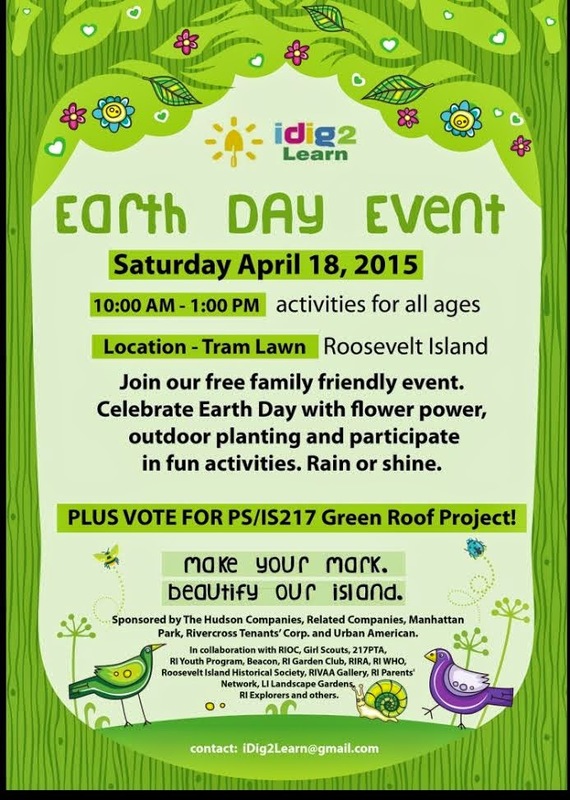 iDig2Learn is hosting a Roosevelt Island Earth Day celebration Saturday, April 18, at the Roosevelt Island Tram Lawn. 9AM - Volunteers needed for iDig2Learn hosted Earth day event tomorrow on the Tram lawn. Please show up at 9 AM to help with set up and sign in so the children and their families can enjoy all the activities from 10 AM to 1 PM on the Tram lawn. Our sponsors at Riverwalk, Shops on Main, Manhattan Park, Rivercross Tenants’ Corporation, and Roosevelt Landings support this free event for all ages. iDig2Learn is hosting an Earth Day event Saturday (April 18), 10:00 a.m. to 1:00 p.m. on the Tram lawn next to the Visitor Kiosk (rain or shine). Children and adults plant flowers and join in activities such as an archaeological dig box to hunt for shark’s teeth, a creative art activity for children with RIVAA gallery artist Connie Tanner, a “Jump-in!” exercise with Island mom Paulina Mansz, healthy food tastings courtesy of Laila Amatullah from the Roosevelt Island Women’s Health Organization, Book reading with Eva Bosbach, Earth-inspired art with Bonnie Goodman, a tree of life activity, and more. Special guests from NYC Parks, TreesCount! 2015, and you can learn more about joining a citywide initiative and tree stewardship. This event is only possible with collaboration from RIOC, Girl Scouts, 217PTA, RI Youth Program, Beacon, RI Garden Club, RIRA, RIWHO, Roosevelt Island Historical Society, RIVAA Gallery, RI Parents' Network, LI Landscape Gardens, Fantastic Gardens, RI Explorers and countless volunteers. Ms. Delfico spoke to the April 1 Roosevelt Island Residents Association (RIRA) Common Council about the Earth Day Celebration. Concurrent with the Earth Day event, there will be the 2015 Participatory Voting site at the RI Historical Society Visitors Kiosk near the Tram, from 11AM to 5 PM. If you are a District 5 resident, you are 16 years or older you can support the two island projects that made the ballot, and you don’t need to be US citizen or registered voter. and installation of hearing impaired technology at the Roosevelt Island Public Library. 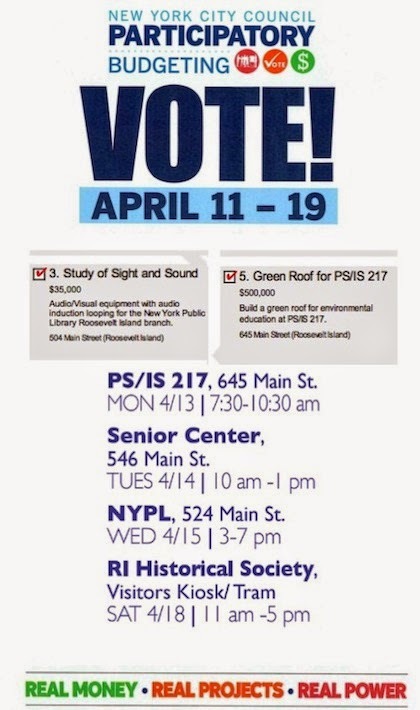 More information on Participatory Budget Voting at this prior post. 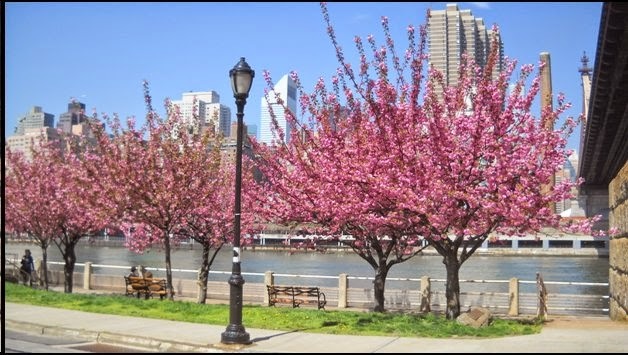 These Cherry trees are on the Queens side of Roosevelt Island next to Capobianco Field opposite PS/IS 217. The Roosevelt Island Operating Corp (RIOC) Board Of Directors meet later today. PLEASE TAKE NOTICE that a Board of Directors meeting will be held on Thursday, April 16, 2015 at 5:30 p.m. at the Cultural Center Theater, 548 Main Street, Roosevelt Island, New York, for the purpose of transacting such business as shall come before the Board. Below is March 31 memo from RIOC staff to RIOC President Charlene Indelicato and the RIOC Board in support of funding allocation to the Roosevelt Island Youth Center. RIOC intends to issue a Request for Proposals in the fall of this year for an entity to operate the Youth Center. However, in order to provide for efficient continuity of these programs, the budgeted funds for the current fiscal year should be pro-rated to the RIYP through December 31, 2015, in the amount of $131,250. RIOC would also require RIYP to continue to provide an appropriate accounting of the funds. Based on the foregoing, we recommend the approval of the disbursement of $131,250 to the Roosevelt Island Youth Program. from the RIOC Board package materials. UPDATE 11 PM - The authorization to approve funding for the Roosevelt Island Youth Center was approved by the RIOC Board earlier this evening. RIOC staffer Sean Singh briefed the RIOC Board followed by a discussion among the Board members before approving the funding authorization. The Zipcar, Landscaping and Motorgate authorizations were also approved. The Kraitz sculpture authorization and Garden Club license agreement were postponed. Roosevelt Island Community Emergency Response Team (CERT) member Frank Farance reports on and shares photos from Roosevelt Island Tram Evacuation Drill held Sunday April 12. 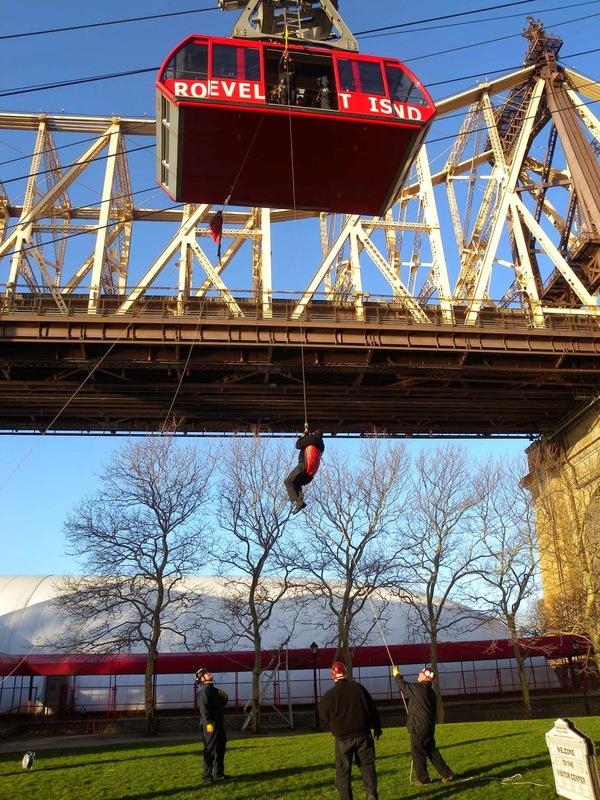 Roosevelt Island Tramway staff acting as "passengers" to be evacuated from the tram. Getting explanation of rescue procedures from tram supervisor. Roosevelt Island Tram Evacuation Drill: As Tram staff explained: there are many redundant and backup systems to return tram cabins to stations, including having the second tram pull up side-by-side -- evacuation like this is a last resort. A second tram rescue is one of the options before resorting to passenger drop evacuation. Mr. Farance explains evacuation procedure for lowering Tram Riders to the ground from the Tram Cabin. The passengers are first fitted into a "diaper" that is attached to the pulley (which holds 9000 lbs), then they would drop down (slowed by centrifugal braking) while rescue workers on the ground use guide ropes to reduce swaying, and they land on the ground (the 5 mm cable supports passengers up to 900 pounds). Notice that while the diaper holding the passenger going down, a second diaper on the other side of the pulley goes up to ready the next passenger. See passenger drop video below. Photo 1/4: Passenger is readied, wearing orange "diaper". Photo 2/4: Passenger descends as second "diaper" returns upward on other side of the pulley. Photo 3/4: Passenger descends, workers below holding guide ropes so passenger doesn't sway. Photo 4/4: Passenger lands, workers on the ground detach "diaper" to release passenger, workers above are readying the next passenger with second "diaper". Pulley holds 9000 pounds, has centrifugal brake that limits passenger drop speed, 5 mm drop cable holds 900 pounds. The second part of the emergency drill is pulling the tram's haul cables back and swapping drive wheels (big orange gear) -- think of pulling a rubber band off a pulley. Here workers are bolting on sleeves onto the cables that are pulled back via hydraulic jack, which gives them enough slack to thread the haul rope on the backup drive adjacent to it (big yellow gear behind big orange gear). Truly amazing. Main drive wheel (orange), backup drive wheel (yellow) is behind. Haul rope (the cable) is swapped onto the backup drive. Mr. Farance also participated with NYC wide CERT Teams assisting following the March 26 East Village Building fire, explosion and collapse. He reports on the experience here. More on NYC Office Of Emergency Management Community Emergency Response Team (CERT) here. 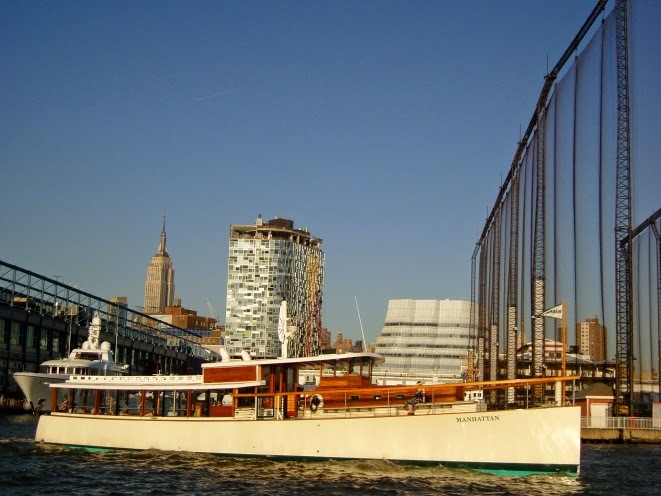 Would you like to take a boat tour around Roosevelt Island on Saturday April 18? 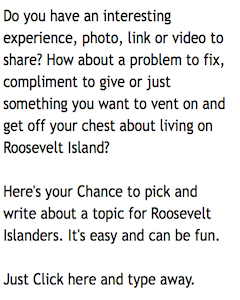 The AiA and Four Freedoms Park Conservancy will jointly offer a special guided boat tour around Roosevelt Island. The tour will focus on Four Freedoms Park and the past, present, and future of Roosevelt Island. Stephen Martin, Conservancy Director of Design and Planning, will chronicle the fascinating and painstaking team effort that led to the faithful 2012 completion of Louis Kahn’s 1973 design for the FDR Four Freedoms Park located at the island’s Southern tip. Specific design goals and construction details of this uncompromising memorial will be clearly identified and discussed. It's a two hour tour starting at 1:30 with the boat departing from the Chelsea Piers. Cost is $58 per person. More information here. Here's a boat ride I took in 2013 on the Hudson and East River. It's a great way to see the NYC waterfront. 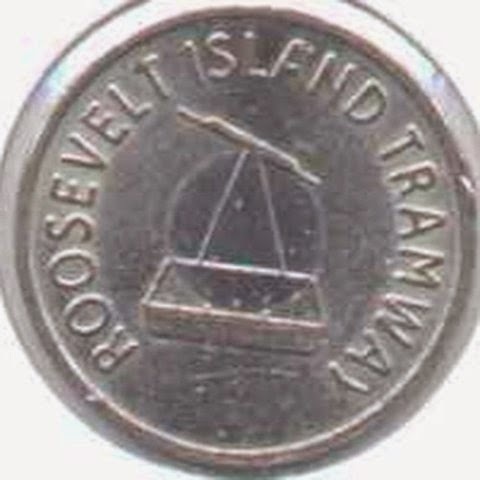 On March 1, 2004, the NY Times reported on the last day of use for the Roosevelt Island Tram token. and upcoming Main Street Construction. PLEASE TAKE NOTICE that a meeting of the Operations Advisory Committee of the RIOC Board of Directors will be held on Wednesday, April 15, 2015 at 5:30 p.m. at the RIOC administrative office, 591 Main Street, Roosevelt Island, New York. 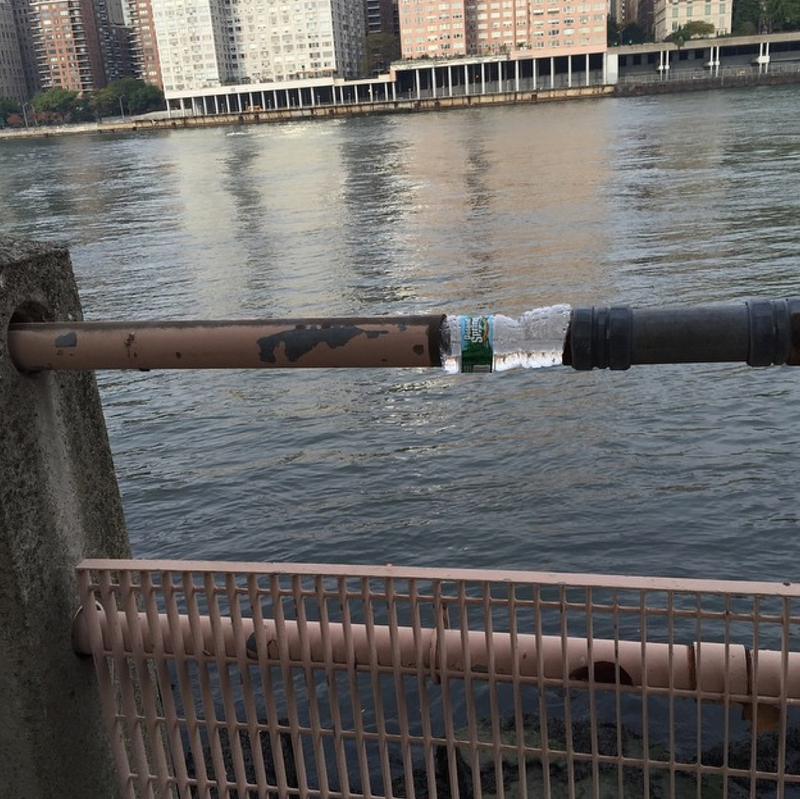 Here's a discussion of necessary Roosevelt Island seawall improvements by RIOC President Charlene Indelicato and RIOC Director David Kraut during October 22, 2014 RIOC Audit Committee meeting on RIOC's Proposed 2015-16 Fiscal Year budget. An audio web cast of the meeting will be available soon after the meeting. UPDATE 4/16 - Audio web cast of meeting is here. Roosevelt Island Operating Corp (RIOC) Public Safety Officer Jeff Laszczych met with Roosevelt Island Brownie Troop 3001 last night to teach about calling the emergency 911 system. Last night public safety officer Jeff Laszczych visited our troop of second and third grade girls to talk about emergencies and when you should (and should not) call 911. The girls learned about the importance of calling 911 in emergencies and how to make the call. Special thank you to Jeff for his time with our Roosevelt Island Girl Scouts! 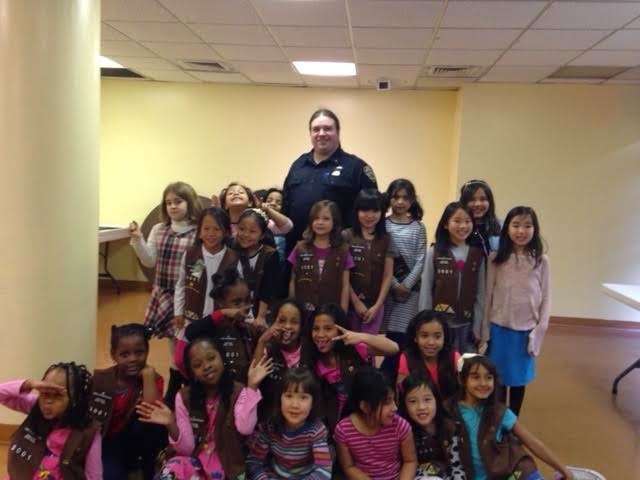 Officer Laszczych's visit with the local Brownie Troop is an example of community policing efforts being made by the Roosevelt Island Public Safety Department (PSD). During the March 31 meeting of the Roosevelt Island Residents Association (RIRA) Public Safety Committee, PSD Chief Jack McManus and Deputy Chief Lynda Marmara described their philosophy of community policing in response to a question from resident Ron Davidson. Participatory Budget Voting began this morning on Roosevelt Island to help allocate $1 million in NYC taxpayer capital funds for Council District 5 which includes Roosevelt Island, the Upper East Side, Midtown East and El Barrio. ... you will be empowered through direct democracy to vote on how $1 million in taxpayer dollars get spent in our neighborhood. Audio/Visual equipment with audio induction looping for the New York Public Library Roosevelt Island branch. Build a green roof for environmental education at PS/IS 217. 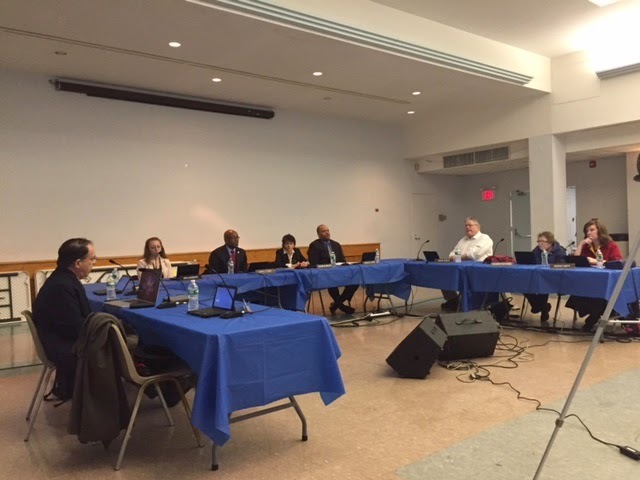 During the April 1 Roosevelt Island Residents Association (RIRA) Common Council Public Session, Christina Delfico and Sharon Berman urged support for the Roosevelt Island Participatory Budget projects. Here's what they said. More on the PS/IS 217 Green Roof and hearing impaired technology projects at this previous post. 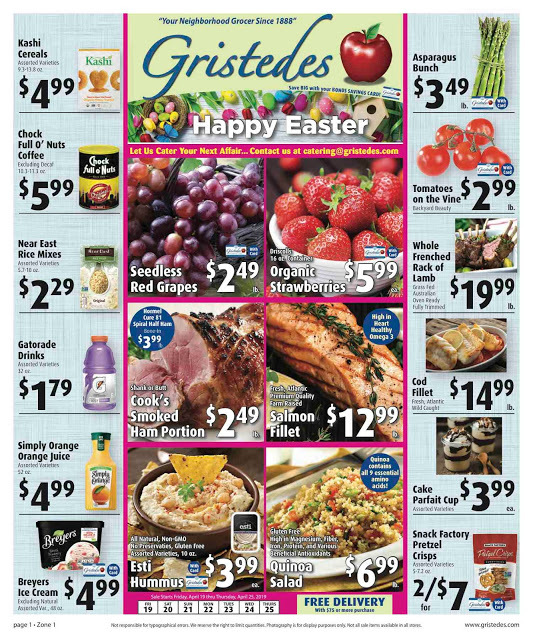 MON, APRIL 13:​PS/IS 217, 645 Main St., 7​:30 A.M. - 10:30 A.M.
TUES, APRIL 14:​RI Senior Center, 546 Main St., 1​0 A.M. - 1 P.M. WED, APRIL 15:​RI Public Library, 524 Main St., 3​P.M. - 7 P.M. SAT, APRIL 18: RI Historical Society Visitors Kiosk Tram 11 A.M - 5 P.M.
Also, WEEKDAYS, APRIL 13-1​7: District Office, 244 East 93rd St. 9 A.M. – 6 P.M. 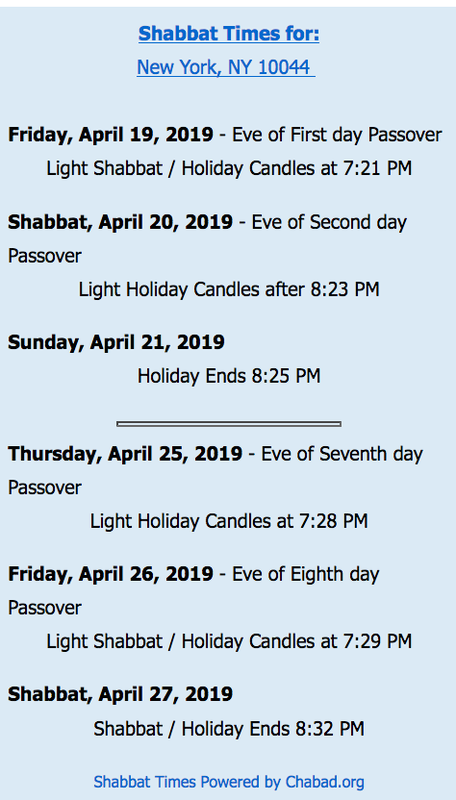 WEEKENDS, APRIL 11/​12 & 18/​19: District Office, 244 East 93rd St. 12 P.M. – 4 P.M. Here is the full list of District 5 Participatory Budget Projects. 1. Cool Reading: $500,000 Upgrade the cooling system for the New York Public Library Webster branch. 1465 York Ave.
2. Bright Minds: $280,000 Replace and improve the exterior lighting on the New York Public Library East 67th Street branch. 328 E. 67th St.
16. Bus Bulbs on East 86th Street: $150,000 Bus bulbs with streetscape improvements to support pedestrian safety and off-board payment on E86th St at Lexington and Third Aves. ... In short, someone should ask Council Member Ben Kallos why he wants to spend a half-million on the school when the real budgetary needs are elsewhere. We have many Island organizations that could use a fraction of that money, our neighborhood is still approximately 2/3 affordable housing. Meanwhile, the Upper East Side is swimming in money ... an extra half-million? No problem when there is money for everything else on the UES. ... our Councilmember should be more it touch with the Island's organizations and their needs, not an expensive shrine to the needs of a few. And spend money on Air Quality Monitoring, a really important benefit to everyone. Mr. Farance's full comment is here. and asks for your vote. Both rank and feasibility are the determining factors of what gets on the ballot -- and, in this case, the agency that would handle the project, DOHMH, was not in the pb process (and DEP was not the right agency to administer this project). We are happy that 2 of 16 proposals this year are from the Roosevelt Island delegates, so RI will be very well represented on the ballot! 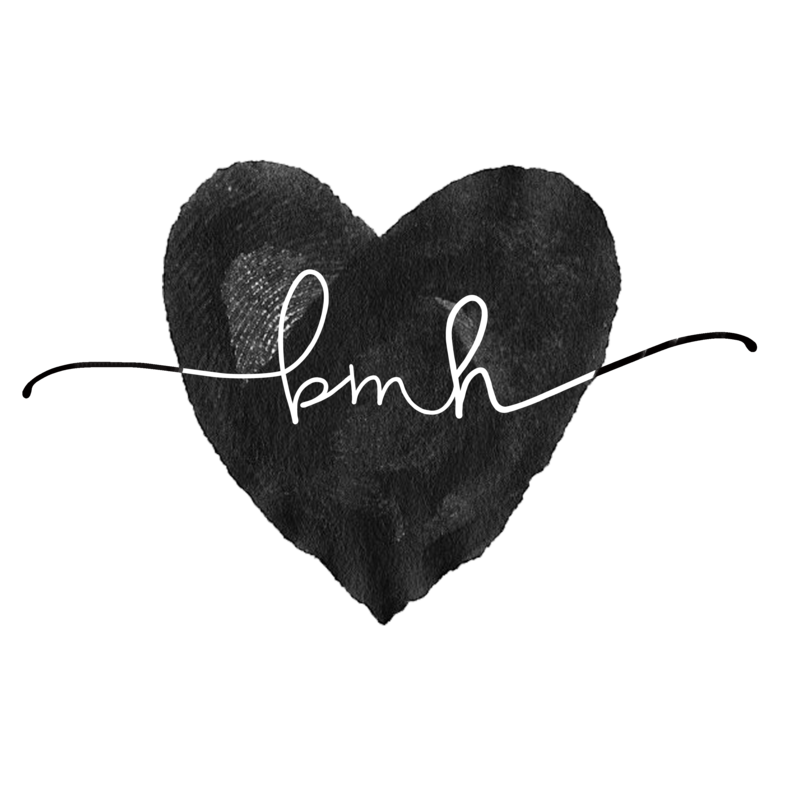 The DOHMH is the NYC Department of Health and Mental Hygiene. DEP is the NYC Department of Environmental Protection. 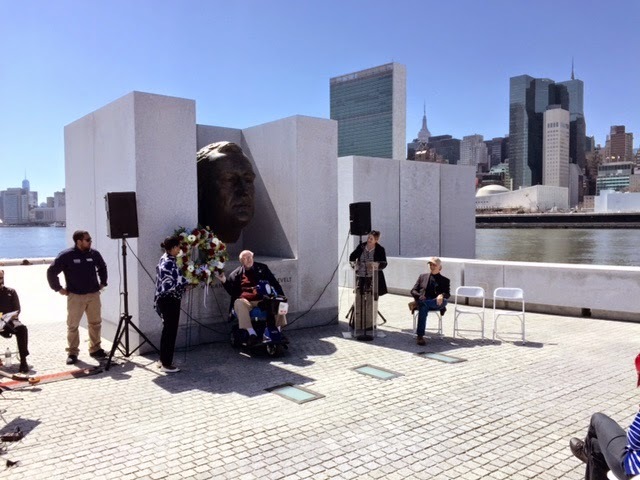 The Roosevelt Island FDR Four Freedoms Park held a wreath laying ceremony this afternoon to commemorate the 70th anniversary of President Franklin D. Roosevelt's death. a wreath in honor of President Roosevelt. Following the wreath laying, historian Harvey Kaye, author of The Fight For The Four Freedoms, spoke about the legacy of President Roosevelt Island and the New Deal. @kevinrns @4FreedomsPark I get u - but the views are spectacular !!! I Am A Pilgrim and Will The Circle Be Unbroken. Ms. Brown closed the commemoration and invited everyone to come back to visit and support the Four Freedoms Park.